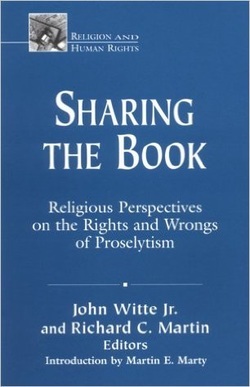 Book: Sharing the Book - John Witte, Jr.
More than a dozen religious leaders offer authoritative statements and analyses of classic and contemporary perspectives on mission activity and conversion in Judaism, Christianity, and Islam. "Well researched. Well written. Enlightening. Indispensable for anyone who grapples with the ethical issues generated by proselytism as they relate to conversion, religious liberty, and persecution." "This book confronts one of the most important issues facing believers who live in the current religiously pluralistic world, proselytism. It is essential for everyone to be aware of the wide spectrum of views presented in this volume if destructive interfaith conflict within multifaith societies is to be avoided or at least reduced." "Religious pluralism is a major issue globally and domestically. The Children of Abraham (Judaism, Christianity, and Islam) have had a long and at times contentious history influenced by theologies of proselytism. Sharing the Book provides an important and challenging discussion and perspective on past realities and future possibilities." "Sharing the Book is an enormous contribution to the understanding of how human rights can be understood and justified in a world wide context. It explains the grounds, and also the limits, of our hopes for universally recognized human rights from a variety of religious perspectives." "How proselytism relates to human rights has proved highly contentious. The variety of perspectives afforded in this timely collection will help illuminate many important points and stimulate discussion."